The seeds for Corin Manning’s STEM love were planted early: when she was in kindergarten, her parents enrolled her in a NASA-sponsored program called Science, Engineering, Mathematics and Aerospace Academy (SEMAA) at Tri-C Metro Campus (it’s now called the Minority University Research and Education Project). 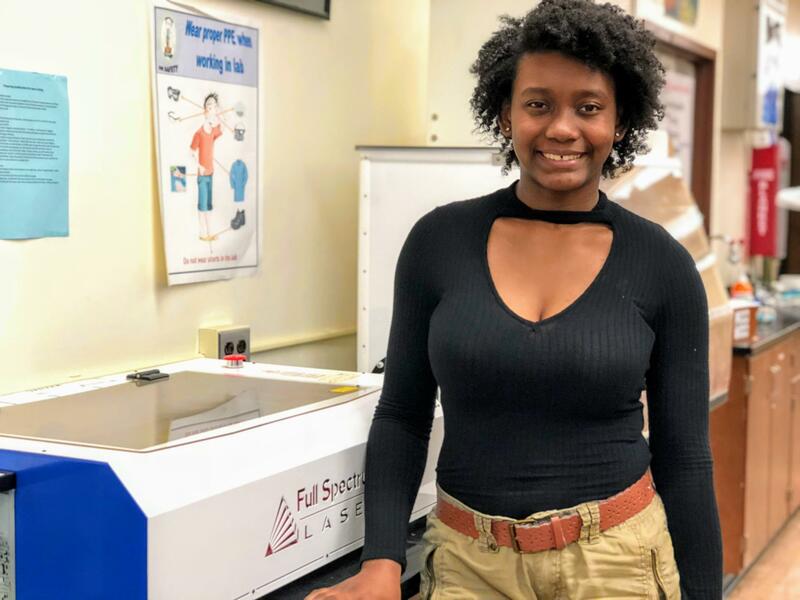 Ever since, the Shaker Heights High School senior has been engaged in science both inside the classroom and during her free time—both her own choice. This year, her course-load includes Advanced Digital Design, Honors Physics, AP Calculus and Honors Engineering Applications. When she’s not studying, she spends time on her hobby-turned-part-time-job: web development. Learn more about this phenomenal 17-year-old and how she cultivated her passion for STEM. Tell us a little bit about how your interest in STEM began. From kindergarten through eighth grade, I participated in SEMAA. My parents signed me up the first year and after that, I just wanted to keep going. It was mostly science and math, but we had these opportunities to see some cool labs and real-world applications of science, so I eventually knew that I wanted to be a part of doing something like that. And during the summers from sixth to eighth grade, I did a camp called Math Corps where we learned advanced math skills and how to play chess. I think that camp was really good because it showed me how important math is to the world we live in today and because it helped me prepare for high school math. After the eighth grade, I attended a summer camp for African American high school girls called IndeedWeCode. The camp is for girls who want to learn how to code and how to succeed in STEM fields. Today, those of us who stayed with the camp throughout the years help the younger girls and we teach them what we’ve learned. During the school year, we teach kids and adults to code at conferences. Last March, we traveled to Columbus to teach Ohio Board of Education members how to code so that they could see how important coding and computer science classes are to our curriculum. It sounds like you’ve become a bit of a STEM advocate. What’s your advice to students who have the same interests as you? I’ve taken as many science, math and engineering classes as I can in high school. There’s also some pretty cool technology in some of those classes, especially in the engineering classes. You learn how to use 3D modeling programs like SketchUp and you can learn how to use tools like the 3D printer and a laser cutter. These are all things that I know will contribute to my future plans. Speaking of, what are your future plans? I’ve got a few different colleges on my list, but I want to keep my options open and evaluate which one is right for me. Right now, I’m doing some work as a website developer, so I’d like to learn more about what that means in the bigger world and how it relates to software and app development. How much experience do you have in website development? The first website I created was at IndeedWeCode. Eventually, IndeedWeCode asked me to be a part of the website design team. As website manager, I’ve worked on two different updates and maintain the site year round. Also, another great project I worked on was a website for Kids In Flight, an organization that grants opportunities to children with serious illnesses or disabilities to fly on chartered aircraft. One of my mentors helps with Kids in Flight, so she connected me with the organization. What other ways have you been able to take what you’ve learned and apply it to the world around you? Last year, I took computer science at the High School and that was helpful. I had already learned six coding languages, but I hadn’t learned Java. Learning Java is what helped me to get an internship last summer in the Rockwell Engineering Pathways Program at Rockwell Automation in Mayfield Heights. That was such a learning experience right from the beginning. When I applied, I had to create a resume and then I had to go through the interview process. In May, I found out that I would be one of 10 interns—three high school students and seven college students—who would get hands-on experience with industrial automation, software development and engineering. I can return every summer through college to work as an intern, which will definitely help with my post college plans. Which IB attribute do you think you best exemplify? I'd say that I’m Balanced because I am involved in so many extracurricular activities, but I’m still able to maintain good grades and have a social life.